State of Origin was on during the week, so I thought after my rants last year that I should say some good things for a change! NSW picked a team that I was much happier with - less hothead and blowhards, more professional footy players - and a captain who lets his football speak for him. Boyd Cordner leads by example, and sets a good example. I was hopeful that they might win, or at least have a great game, especially given the injuries and missing players Qld had. They overshot my expectations. The NSW team played like a bunch of absolute professionals. It was impressive, and a really good turn about from the last decade of teams. Unfortunately, the NSW media the last few days have been a bit tough to take, claiming NSW thrashed Qld and spruiking a new dynasty. I didn't see the game like that. Sometimes I wonder if I watched a completely different game. 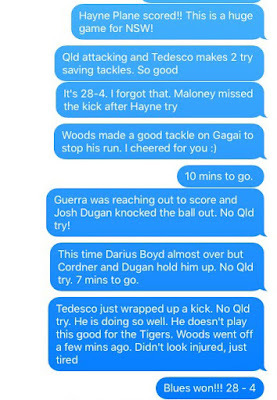 My nephew could only watch the first half of the game, so I messaged him some random comments through the second half so he didn't miss out completely (he's a Tigers and Aaron Woods fan). Strangely enough, my messages reflect the game I saw and the view I have that NSW were lucky, and, admittedly, created their own luck too by being a really solid team. They backed each other up. They worked together. They each did their job. 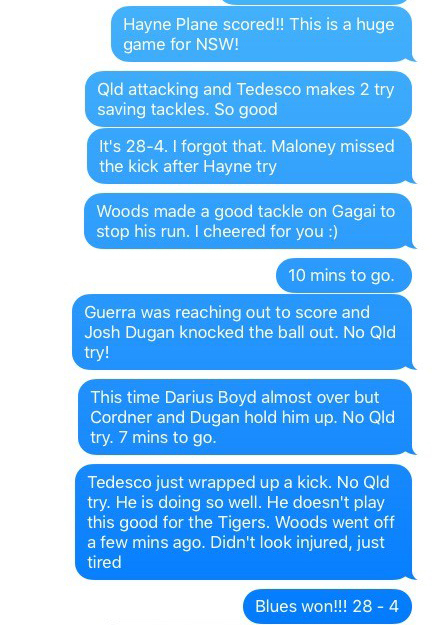 My messages (on right) show 4 potential tries for Qld, 3 of those in the last 10 minutes. If Qld get these tries, any of them, it could have made it a very very different game, possibly even result. Tedesco made 2 try saving tackled. Dugan whacked the ball from Guerra's hands. Cordner and Dugan hold up Boyd. Tedesco wraps up a kick. Given in the first half that there were a couple of NSW tries that involved luck (like Fafita's one where O'Neill coughed up the ball), I think NSW were lucky to win. Yes, they played well, yes, they deserved to win, but I don't see a thrashing here. I saw a great game. I saw a big improve from the Blue. I saw areas where Qld can, and will, improve. I'm looking forward to a fantastic Game 2! If you watched, how did you see the game?